"An elegant and authoritative telling of the true story. ... We, and not our prehistoric ancestors, are the true 'mushroom people.' From full-moon parties in Thailand to stalls in Camden Lock, neopagan festivals to Internet spore-suppliers, there are far more 'shroomers' today than ever before." "An extraordinary account. ... With its easy style and witty handling of scientific analysis, it makes a fascinating and satisfying read." "Shroom is a work of love, an obsessive, detailed and definitive reference work, addictive for its insights, broad in its ambition." "Andy Letcher, one-time psychedelic musician and former bypass protester, charts the path to the ban [on the sale of magic mushrooms] in this intelligent and well-researched book, which is full of surprises." 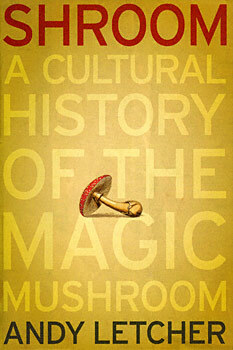 "A superb cultural history of the magic mushroom. ... An immensely entertaining and exhaustively researched work, remarkably level-headed bearing in mind the subject matter, and with much wry humor." ""This man loves his mushrooms, and by the end of this book you too will be as spellbound as Alice is in Wonderland. ... Letcher is both historian and hippie, and he sees so much in mushrooms to examine, question and celebrate that it becomes a thrilling trip that is both erudite and greatly entertaining. Mind-bending stuff."